Why carry all these ingredients with you? Make one and done, great for picnics, tailgating and camping! Condiments are great on hot dogs, hamburgers and sausages! In a large bowl, combine beef, onion, salt and pepper. Divide evenly into 8 patties. Flatten to create mini burgers. Heat a large skillet to medium-high heat, add coconut oil and heat. Place burgers in skillet and cook 3-4 minutes per side. Choose your favorite condiment below. In a medium bowl, combine topping ingredients. Stir until thoroughly combined. 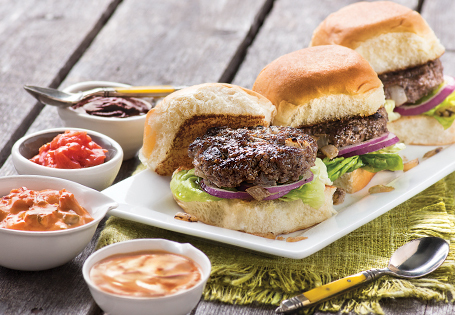 Place sliders on sweet rolls and serve with crazy condiments!